Searching for a reliable copier repair technician can be a overwhelming task in South Florida. If you’ve noticed there are not too many of these guys around. Today, we’ll take a look at what are the important things to look for when your copier needs parts or repair. Copier repair can soon become bewildering and unless you have experience with computers and other electronics going beyond the plastic paneling is risky. There are literally thousands of moving parts in today’s photocopiers. There have even been some engineers that suggest on paper these should NOT actually work at the efficiency that they do. Well, thank goodness they were wrong and we don’t have to sweat the details. Copiers are not design for the DIY (do it yourself) repair. Let’s take a look at why you’re in this undesirable position to begin with. Most copier issues (and I mean 90%) are a simple matter of understanding where the jam originates in the paper path. The paper path is from the paper drawer to the exit on to the paper tray. So, it’s always good practice to start at the beginning. The drawer starts elevating the paper (once closed) to a rubber pickup roller. This roller not unlike a tire on a car wears out over time. For example it may pick up the first two pages, but fail to pick up the rest, thus halting the entire production. Once the copier detects there’s an issue paper deep in the path are left for your to manually remove them. So, ask yourself “Where in the paper path dose this originate?”. Having the answer may save you time and money. It may only be a $5 roller. Typically we don’t scrutinize our technicians as we would for a reliable auto mechanic when it’s our own car that needs repair. However, I challenge you to consider doing this. There are several levels of technicians, color specialist, and Black/White only techs. Digging further you’ll learn that brand, model, and year will also be key factors when contracting a technician. 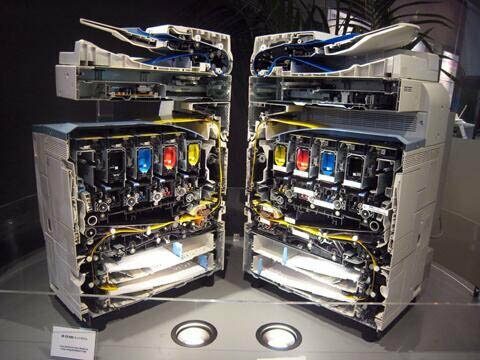 An example is a tech only certified on late model Black copiers billing you $95 /hr to examine your color machine. The tech is willing to take the call and you’re willing to take the risk. The tech is crossing his fingers that it’s a simple matter of cleaning or removing a jam, however if it’s a color specific issue he may learn on the job. (You pay for this education, plus copier parts) This isn’t meant to scare you, rather create an awareness of who you pay for service. Be sure to ask about our service contracts and the benefits to having peace of mind. After you name your own price simply print or save any quote. Remember to ask about our guarantee approval on our copier lease programs. We provide an advantage for startup businesses, non-profit organizations, and companies looking for quick and easy qualification. Our Goal is to provide quality copier and printers to small and medium sized business. We specialize in office printing, copier lease maintenance, and copier repair. Now offering Nationwide Leasing and Copier service.